Adequate nutrition is a right for all and an essential condition of a children physical, mental and psycho-affective equilibrium as well as quality of life of the adult. Malnutrition in all its form, damages the health and the well-being of the population. It is also a heavy burden because of the negative socio-economic impact it has on the individual, the family, the community and the state. Today, almost one third of the children under five suffer from stunting and three-quarter do suffer from anaemia. A quarter of women of childbearing age are overweight or obese and nearly two adults in five do suffer from high blood pressure. Children suffering from stunting do experience cognitive delay which affects their academic performances and has a long-lasting effect on their work capabilities and revenues once they become adults. These children also grow with a higher risk of becoming obese and to suffer from certain chronic diseases which prevalence are on the rise in our country. All this has a considerable effect on the human capital development and threatens to permanently jeopardize our economic d social development goals. The issue of under nutrition, in particular, has worsened over the last decade with the successive crises. The normalization of the social climate in which prevail the country since 2011, under the high authority of the President of the Republic, His Excellency Mr. Alassane OUATTARA, favours the improvement of the situation. It is therefore essential, for health and ethical and political and social and economic reasons, to eradicate malnourishment in all its form with a special attention to the vulnerable groups. The operationalization of our country’s commitments resulted in the elaboration of the 2016-2020 National and Multisectoral Nutrition Plan (NMNP). The implementation of this plan, worth around 267 billion, will lead to a sustainable improvement of the population’s nutritional status and to facilitate a more inclusive growth and development. 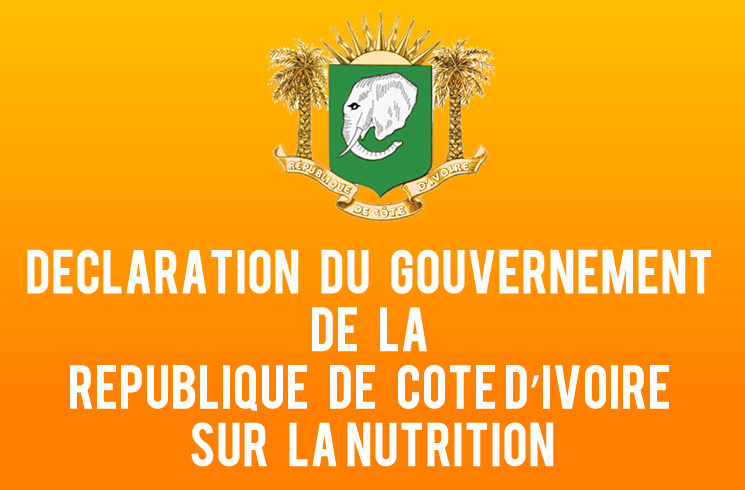 Through the 2016-2020 NMNP, the Government of Côte d’Ivoire reiterate that nutrition is a national priority. Le site internet est donc un appui à la mise en œuvre de cette approche multisectorielle qui requiert le partage de l’information et la valorisation des activités des différentes parties prenantes.